A very light and attractive room and makes a delightful venue for wedding parties and larger events. It has been beautifully restored and modernised in recent years. The space can comfortably accommodate up to 80 guests dining, up to one hundred people sitting as for a lecture, and as many as one hundred and fifty people standing. Small or large tables and chairs are available. The Main Kitchen is adjacent to the Hall making it particularly accessible for lunches and dinners. The Priory has a garden at the front overlooking the River Monnow providing a pleasant extra space in summer. Situated on the first floor, can be accessed either from the front or the back of the building where there is a stairlift. This beamed room is very light and airy with windows on both sides giving excellent views over the River Monnow and the countryside beyond. The Geoffrey Room is well suited to exhibitions, training events and smaller parties. There is additional space available in the Quiet Room. A small kitchenette and toilet are available on the same floor, while toilets on the ground floor can be reached via the back stairs whatever else is happening in the building. Here are two kitchens, one on each floor. The main kitchen on the ground floor is fully equipped with ovens, dishwasher, hot cupboard, urn, refrigerator, crockery and cutlery. The upstairs kitchenette, with a small fridge, is suitable for the provision of tea and coffee. 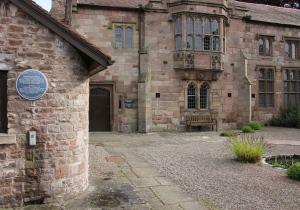 The garden at the front of Monmouth Priory was designed to complement the building and to provide a peaceful space to sit.